Use Amazon to Help Us! All you have to do is click HERE, and you’ll arrive at a Sequart-referred version of Amazon. (Better yet, click through once and bookmark that page to use every time you shop. This way, you won’t have to remember to come to Sequart.org every time you want to buy something from Amazon.) It’s identical to a regular Amazon shopping experience, but Amazon will donate to Sequart around 7%-8% of your order’s purchase total without adding a penny to your bill. It’s easy and costs you nothing, but it makes a huge difference in supporting Sequart’s operations. Consider it a donation to Sequart without having to give us any money! 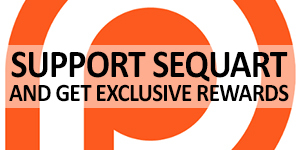 By the way, this process will work for any Amazon banner or link that you find on Sequart.org, so if you’re planning on buying a Sequart book or documentary, please click through to Amazon from that particular product’s page. This will help us much more, about 10%-15% instead of 7%-8%. And if you keep on shopping for anything else, even if you don’t end up buying a Sequart product, we’ll still get the normal 7%-8%. Thanks again!